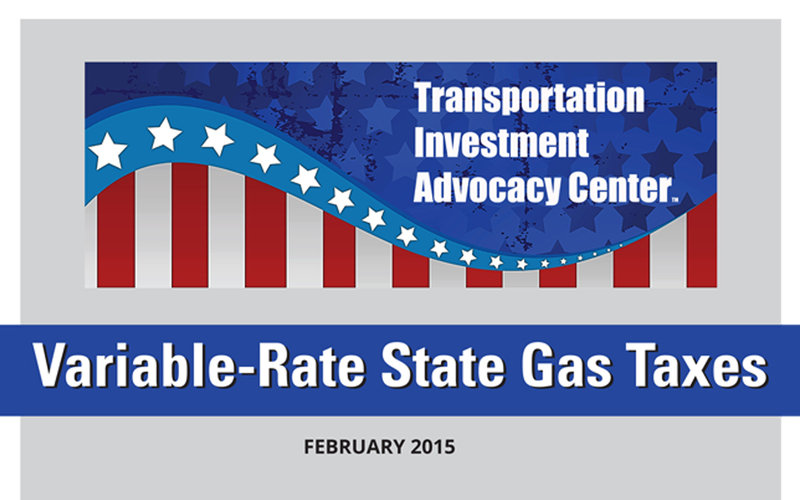 The Transportation Investment Advocacy Center (TIAC) has prepared a detailed study on some of the variable-rate strategies states are using to fund transportation investments. A variable-rate gasoline tax, or one that adjusts the cents-per-gallon charge at the pump based off of the wholesale price of gasoline, general economic inflation, or a combination of the two, is an alternative to a flat excise tax on gasoline. A flat excise tax charges a fixed cents-per-gallon amount on fuel purchases and does not respond to external economic factors, such as the rising cost of construction due to inflation. Eighteen states and the District of Columbia have instituted a variable component to their gas tax in order to ensure that transportation infrastructure supported by the tax is adequately funded. Nine of those states—California, Connecticut, Georgia, Indiana, Nebraska, New York, North Carolina, Vermont and West Virginia—have a flat excise tax on motor fuel and an additional percentage-based tax on the price of wholesale gasoline. Three states—Kentucky, Pennsylvania, and Virginia—deter­mine their gasoline prices solely by a percentage of the price of wholesale gas. Two states—Florida and Rhode Island (starting July 2015)—determine gas prices by consulting the CPI for economic changes. And Maryland adjusts its state gas tax according to CPI and the price of wholesale gasoline.